rheotrophic mires (those fed by groundwater such as the Okefenokee)or swamps (where the dry season water table is always above the surface of the sediment). fen is a rheotrophic ecosystem in which the dry season water table may be below the peat surface. Dry weights of plant materials are dependent upon the specific organ (e.g. leaves 10%; wood 50%) and their contribution to the accumulated detritus is accordingly. Decomposition continues by microorganisms whereby the carbohydrates are used for metabolism and growth, and proteins used for growth. This process is not responsible for Carbon enrichment. Mineralization - decomposition to CO2, H2O, and NH4. Acetogeneic Bacteria cleave the ACETATE or a reduction of CO2 to METHANE by methane-forming bacteria. Overall, this results in the decrease in cellulose and increase in LIGNIN. CELLULOSE is a linear macromolecule depolymerized by hydrolysis to glucose. LIGNINS are alcohols, polymers or mixed polymers of monomer alcohols differing in methoxyl content (-OCH3). LIGNINS comprise up to 70% of the middle lamella of cells, and in bark may comprise 25% of the entire cell! The rate & ratio of cellulose:lignin decomposition:degradation are dependent on the depositional environment. As volatile matter decreases, fixed Carbon increases with depth of burial (Hilt's Law). The rank of the coal is measured by C:O2 content, volatile matter, and moisture. This group maceral represents cell walls of trunks, branches, roots, etc. (telinite); along with the reprecipitation of dissolved organic matter in a "gel" form (collinite); and fragments of vitrinite (vitrodetrite). These include mega- and microspores (sporinite); cuticles (cutinite); plant resins, waxes and other secretions (resinite); algae (alginite) anddegradation residues (liptodetrinite). These include oxidized plant material that may be the result of fire (fusinite); aerobically oxidized plant parts (semifusinite); oxidized "gel" material (macrinite); reworked inertinites (inertodetinite); and fungal remains (sclerotinite). Black, very bright lustre, thin layers that break cubically, thicker layers have a conchoidal fracture pattern. Finely stratified layers of vitrain, durain, and, in some cases, fusain. Medium lustre. Black or gray, dull, rough fracture surfaces and composed of mineral matter. Black, silky luster, friable and soft. Appears like charcoal because it is fossilized charcoal. Black, dull with a luster that may appear greasy. Coal breaks with a conchoidal fracture. Macerals are fine and dominated by exinites, particularly sporinite. Black or brown, dull, homogenous, breaks with a conchoidal fracture and a greasy luster. The coal is dominated by alginite. 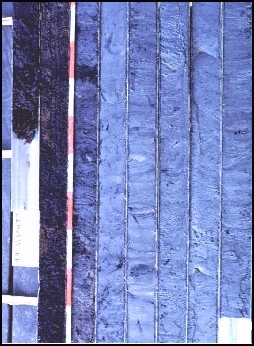 Where the residuals of terrestrial plants are not concentrated in a peat, they may occur as viscous impregnations of sandstone, siltstone, shale and carbonate rocks. These residues are known as BITUMENS. Bitumens are the soluable fraction and the precursors for liquid petroleum, asphalts (residuals of crude oil), mineral waxes, etc. The insoluable fraction result in KEROGENS (yields oil by pyrolysis) and PYROBITUMENS (extracted from coals/lignites). The chemical constituents of organic matter react to thermal maturation, and there is a change in color of the organic debris with increasing temperature. Photometers are used to measure the thin-walled portions of spores to determine the shift in coloration (and flourescence). As the thermal index increases, there is a shift to the red end of the spectrum.